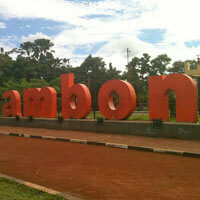 The capital of Maluku Province and the largest city in the Malukus, Ambon has many things to offer. The Maluku islands are were the Dutch started their colonial enterprice and Ambon quickly became the center of the Dutch spice monopoly in the 17th century. 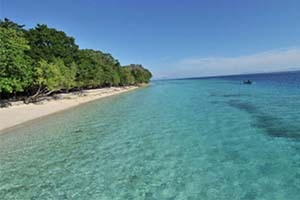 Now, this will be the port of entry for most tourist to this magnificent part of Indonesia. But don't just head out to the beaches for only diving as you would miss some unique historic buildings and island and sights. At Honipopu Beach a Portuguese fortress known as Kota Laha or Ferangi Fortress was build in 1575. 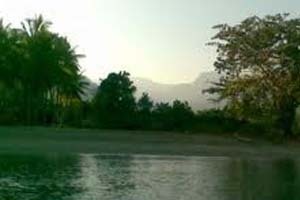 Local people started to live around the fortress which subsequently developed forming Ambon City. The year 1575 was a historical year for Ambon and is still commemorated as Ambon year of birth. Another historic date is when the Dutch Colonial Government gave equal rights to all Ambon citizen on September 7th, 1921. In a seminar held in Ambon in 1972 it was decided that September 7th would Ambons anniversary. The celebration was first held the next year on September 7th, 1973. A very old, unique church is located on the slope of Mount Sirimau. Built in 1546 it still stands, a silent witness of the strugles and historic moments takes place here. You can find an old mosque, Masjid Wapeau, on Mount Wawane. Built in 1414 it is even older than the church. It is a telltale of the history of this area: Islam came and then Christiantiy. The Portuguse, the Dutch, Australians and Japanese came, and all went. 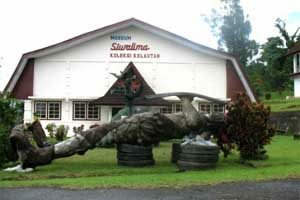 The Siwalima Museum has a fine collections of historical artifacts and traditinally clothing of Maluku. In Kudamati is the Dolan Monument, build to honor the victims of the battle against the Australian army, who were trying to bring back Indonesia under Dutch Colonial control. There are several places where you can see the Morea, a giant kind of eel, best places are Waai village and Wae Selaka Pool. 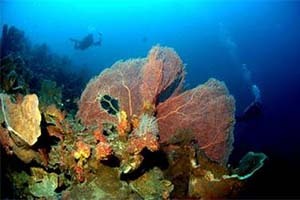 Ambon is not so famous for its history or landscapes but for the incredible views you can get when you go under in the water and dive. 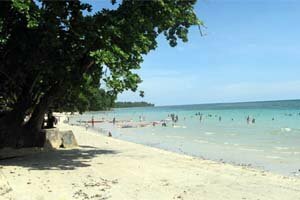 Best and popular beaches for diving, swimming, snorkeling or just lie and do some hard work on your tan are Tanjung Setan Beach, Lelisa or Namalatu Beach to swim, dive or just work on your tan by sunbathing. Inside the National Park is the Pombo Island, which you should visit if you have the opportunity: it is an underwater paradise. Considering the close proximity to the sea it is not surprising that fish is a part in almost all of the dishes in Ambon. Steamed Tuna is very typical local dish, which you can get at one of the many warungs on every street in Ambon. Sayur Genemu is another example of a local dish. It is made of salty fish, bamboo starfruit and a coconut milk sauce. Need place to stay in Ambon?